VAC is proud to announce the continuation of the 2018 fine art exhibition schedule at its Niʻaulani Campus in Volcano Village. 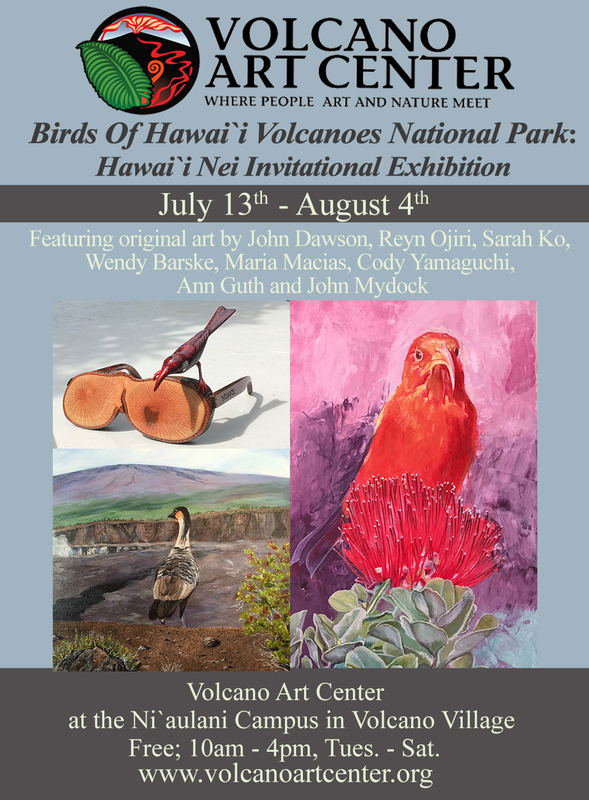 Due to the closure of Hawaiʻi Volcanoes National Park and subsiquently the VAC Gallery, two very special art exhibits will be on display simultaneously at 19-4074 Old Volcano Rd., in Volcano Village. The exhibits including Quilts in the Forest – Where the Path May Lead and The Birds of Hawaiʻi Volcanoes National Park: The Hawaiʻi Nei Invitational will not disappoint those who wish to view a variety of media and artists in one place. Both exhibits will be on display Tuesday –Saturday, July 13th through August 4th, 2018 from 10am -4pm. 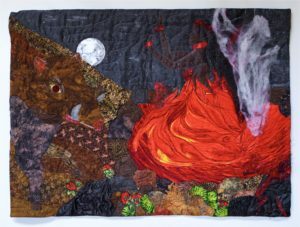 The bi-annual quilt show, this year called Quilts in the Forest – Where the Path May Lead presents 40 quilts by 26 different quilters of Hawaiʻi Island. The exhibition highlights new and innovative ways of quilting and includes three weeks of special quilt programs such as quilt classes and quilt-themed Monday night movies. For specifics about the quilt themed programs please visit the full calendar of events! 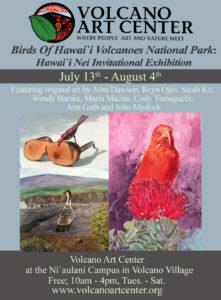 The Birds of Hawaiʻi Volcanoes National Park: Hawaiʻi Nei Invitational exhibition showcases the work of eight artists focusing on the birds of Hawaiʻi Volcanoes National Park. The participating artists, including John Dawson, Reyn Ojiri, Sarah Koh, Wendy Barske, Maria Macias, Cody Yamaguchi, Ann Guth and John Mydock were selected from the 2017 Hawaiʻi Nei Exhibition celebrating native species. For this exhibit the selected artists were asked to represent endemic bird species found in Hawaiʻi Volcanoes National Park. Both exhibitions are open to the public and free of charge in Dietrich Varez Hall, located at the Volcano Art Center’s Niʻaulani Campus at 19-4074 Old Volcano Rd. in Volcano Village. The Volcano Art Center invites all to come see these two great exhibitions and check out the temporary gallery location also located on the campus. The Niʻaulani Campus hosts ongoing classes and workshops, the Niʻaulani Nature Trail (a ¼ mile loop trail through old growth forest), an outdoor sculpture garden and Park Rangers from Hawaiʻi Volcanoes National Park daily from 9am -4pm.